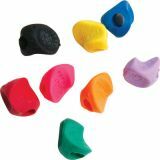 Specially designed pencil grips for learning penmanship, in seven bright colors. Each dimple in the grip is meant for a specific pencil. It's made for use in either your right or left hand. Ergonomic and adorable! Assorted colors.